On March 31st I celebrated 8 years in my apartment. 8 years. Seems like just last week that I was getting the keys and then sitting in the middle of the empty living room floor with a glass of wine. I moved in with very limited furniture (bed, dresser, bookcase) and over the years I’ve furnished my home with new, and new to me pieces (I’ve shared some of them on this blog) and I’m mostly happy with the way that my apartment has come together. That said, two rooms have been difficult to put my stamp on and those are my bathroom and kitchen. My bathroom needs a full-gut reno which scares the crap out of me. The logistics, time, and the money required to fully reno my one and only bathroom have kept me from finally pulling the trigger on it. The other room is my kitchen. Hate is a pretty strong word, but I pretty-much hate my kitchen. 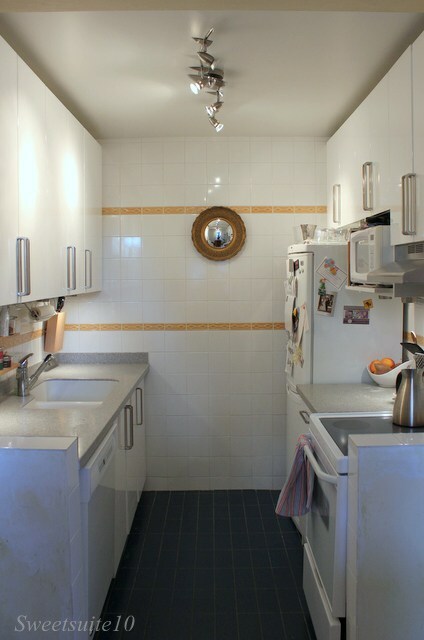 When I bought my place I inherited a kitchen that had been ‘flipped’ and year or so beforehand by a couple that had spent some time in Portugal, and had made some design choices that might have been better suited for that country. One of their decisions was to install doors between every single room in the apartment (I think this is common in Europe, but not in N. America). This was easily rectified, and I even made some money selling the doors on kijiji/craigslist. One of their other ‘improvements’ was to the kitchen where they tiled every available wall surface with square white ceramic tiles, with two rows of embossed tiles in mustard yellow as an accent. That yellow accent tile combined with the blue floor tile (common in my building) bugged me every time I entered the kitchen. My kitchen 'before'. This is from 2012, but nothing much has changed. Note the bane of my existence - the yellow wall tile. I’ve talked about pulling down the wall tile and backsplash since I moved in - I even had some people in to give me some quotes on getting it done but the numbers I was quoted didn’t make sense. One guy told me he’s just glue thin drywall over the tile to make it ‘go away’. I don’t know much about construction, but I know just ‘covering up’ an issue isn’t usually the best way to deal with it. Anyways, to make this long story short – I decided this past weekend that is was time to stop complaining about my kitchen and actually do something about it. As luck would have it, it’s also time for another One Room Challenge (I did the One Room Challenge once before way back in 2014). I figure a set deadline of 6 weeks will help keep me focused. I last blogged about my kitchen WAY back in 2012 when I updated my kitchen handles. Since then I haven’t really made any changes other than upgrade the puck lights under the cabinets to LED and I put in a pendant light I cobbled together from some bits at the ReStore (the halogen lights made such a small space really warm). Sadly as my budget doesn’t allow for a gut, this will be a mostly aesthetic makeover. That said I’m hoping that the changes I make over the next 6 weeks will allow me to love my kitchen. This was such a last minute decision that I don't really have any plans as of yet for this makeover other than to get rid of the tile - Ha!! I guess I'll have to start mining my kitchen board on Pinterest for some ideas. Next week I'll show you some inspiration and hopefully I'll have a bit more of a plan and (more importantly) less yellow wall tile! I hope you’ll follow along while I learn if ripping off wall tile is as easy as they make it look on HGTV and Youtube. Cross your fingers for me. Want some more One Room Challenge makeovers? Make sure you check out the 20 featured designers doing the One Room Challenge, and the other One Room Challenge Guest Participants. Yellow and blue...the colours of Provence! Looking forward to seeing what you do with the space. Good luck! I'm looking forward to seeing what you do in here! Good luck! I love kitchen makeovers! Can't wait to see how you transform this space. Nothing like the ORC to get yourself motivated. Good luck! Looking forward to seeing your design and following along! Oh, this should be fun! :) Looking forward to seeing what you do. yay Michelle you are doing the ORC too! Looking forward to seeing your kitchen plan! This is awesome! It looks like a blank slate you can really personalize to make your own and give it your personality! Kitchen makeovers are so much fun...and expensive. We can't wait to see you work your magic! Can't wait to see your plans! You got this girl! Can't wait to see how your kitchen plan develops. :) Will be here cheering you on!